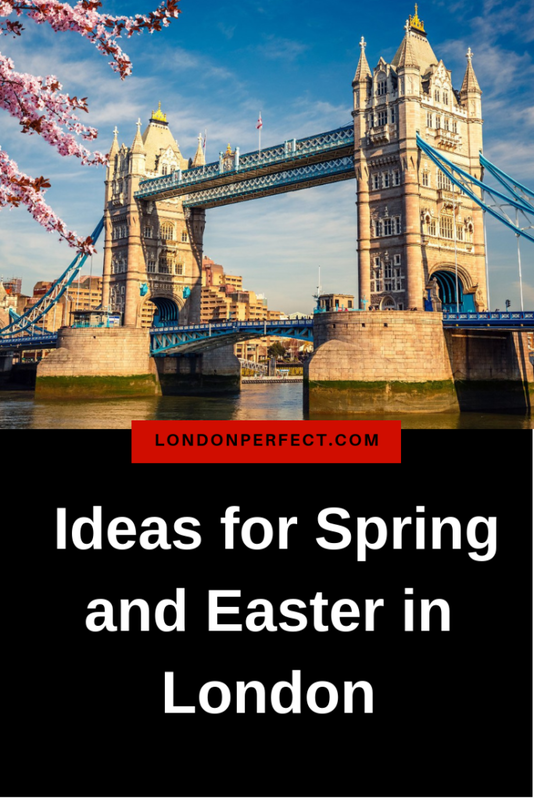 Spring and Easter in London is lovely, when warmer weather kicks in, daffodils and crocuses bloom, and Easter is in the air. 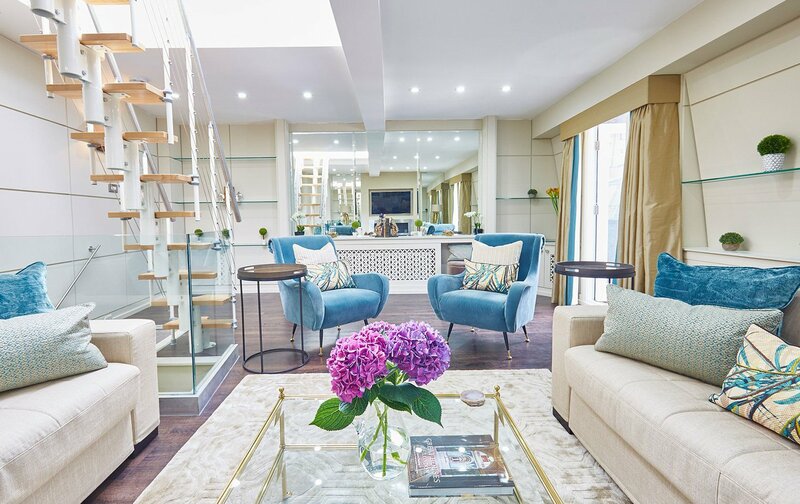 Spring in the capital stretches from March to May, ideal for a re-energizing break in a chic London Perfect apartment. Visit London during the Easter holidays, spanning Good Friday, Easter Sunday and Easter Monday. Hunt for Easter bunnies, indulge with delicious treats, then walk it all off in the great outdoors. We’ve got six spring-fresh ideas to inspire you. 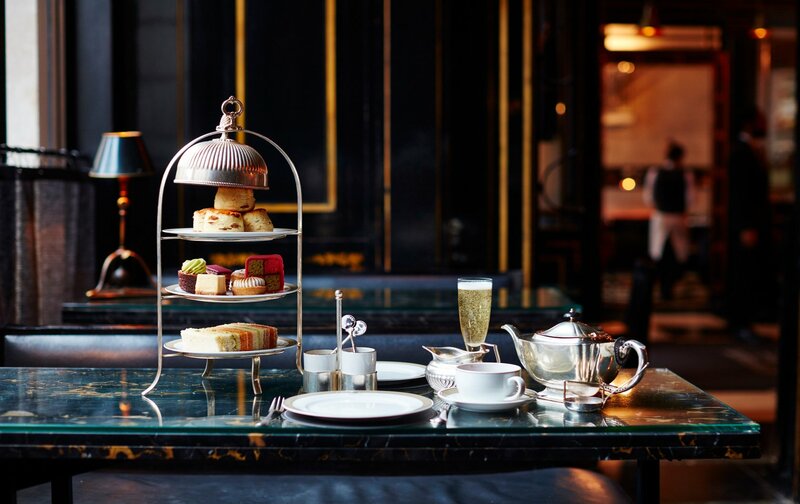 Grand European-inspired all-day café-restaurant The Wolseley on London’s Piccadilly is one of the capital’s most stylish places to take tea. The lofty Grade II-listed 1921 dining hall is an interiors-lover’s dream, resplendent in black and gold, with geometric marble floors. The elegant breakfasts, lunches, and dinners are all acclaimed, but tea is an indulgent treat, perfect for an Easter feast. House-made finger-sandwiches, cakes, scones and pastries star, including old-school favorites such as Battenberg cake and Sachertorte. Reserve in advance, with a choice of basic Cream Tea, full Afternoon Tea or celebrate in style with Champagne Tea. Chocolate éclairs, tarts, biscuits, macaroons and ice cream coupes are also up for grabs. Naturally, the selection of teas is top-notch, with an elegant presentation from silver teapots to white china and three-tiered cake displays. You can also pick up Cognac Chocolate Truffles to go from The Wolseley Shop. The Wolseley, 160 Piccadilly, London W1. Topped with twisty chimney pots, red-hued 16th-century Hampton Court Palace was famously home to King Henry VIII. A half-hour train ride from London Waterloo near Hampton Court Station, its ornate historic palace makes a great day trip. Strolling the gardens is charming in spring, with topiary-shaped trees, ornamental lakes, and a giant vine dotting the elegant grounds. 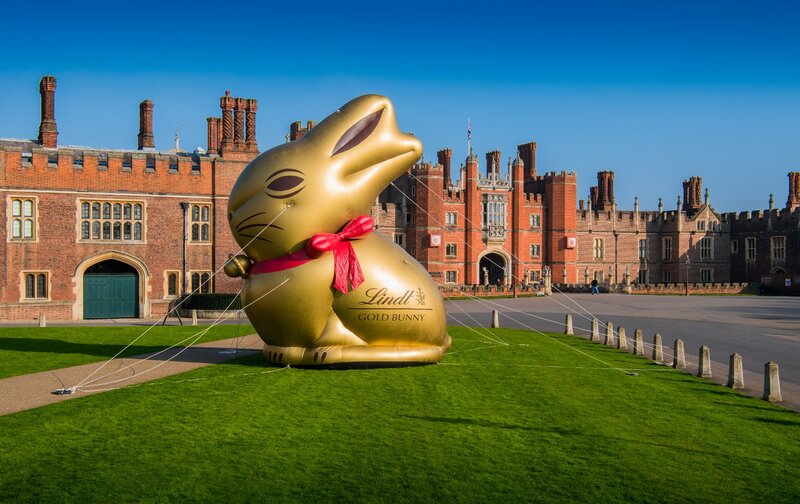 Kids will love the Lindt Gold Bunny Easter Hunt (24 March-14 April), included with palace admission. Gold bunnies will be hiding in the house and gardens, with Easter stories and delicious chocolate prizes to be discovered. Children will also enjoy the palace’s recently resurrected Chocolate Kitchen and the garden’s hedge Maze for getting lost in style. Easter Weekend entry includes ‘Cooking for the Court’ (30 March-2 April), with the King’s Cooks in the Tudor Kitchens. Learn the secrets of Henry’s legendary appetite with live Tudor cooking demonstrations of heritage dishes fit for a king. Hampton Court Palace, East Molesey, Surrey. 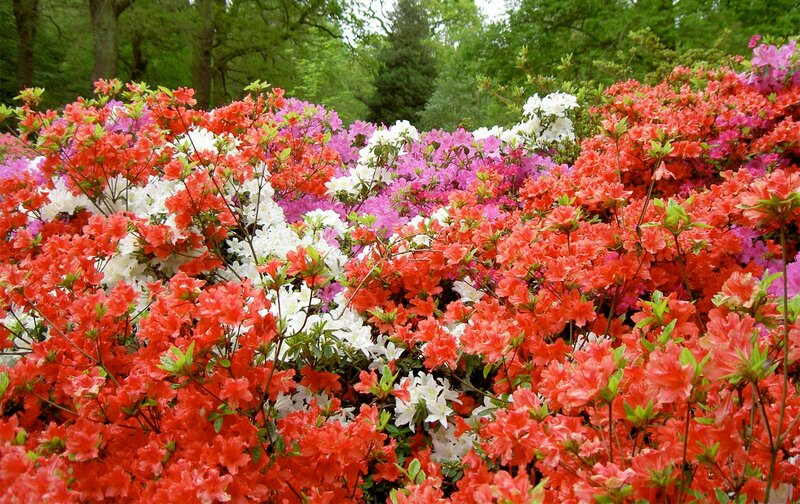 Make the most of spring and Easter in London by catching the azaleas in bloom at Richmond Park’s Isabella Plantation. A 40-acre woodland garden set within a Victorian plantation, it’s at its best in late April and early May. That’s when the Japanese azaleas flower, in rainbow hues from orange to red, reflecting in pretty pools and lakes. The National Collection of Wilson 50 Kurume Azaleas was introduced from Japan in the 1920s by plant collector Ernest Wilson. 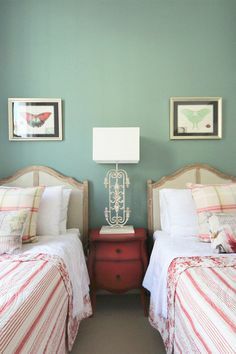 You’ll also spy vibrant rhododendrons in purple and crimson. Exotic pink and white magnolia flowers, camellias, narcissi and jaunty yellow daffodils add to the spring vibe. See the website’s monthly plant diaries for more seasonal highlights. Opening hours mirror those of expansive Richmond Park, in London’s south-west, home to herds of deer. Feeling peckish? Petersham Nurseries is nearby with a celebrated café (reservations required), teahouse, nursery, and homewares and garden shops. Isabella Plantation, Richmond Park, Richmond, Surrey; Petersham Nurseries, Church Lane, off Petersham Road, Richmond, Surrey. Spin along the River Thames on your bike. Feel the breeze in your hair as you peddle through the city on London Perfect’s River Thames Bike Tour. 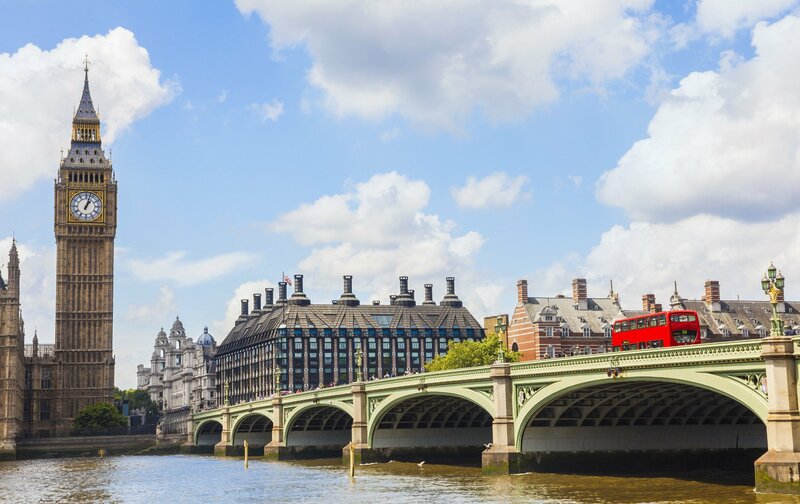 Spot monuments and markets as you spin along the atmospheric Thames riverside, with four-hour tours starting from April. You’ll ride over historic Tower Bridge, and explore elegant covered Leadenhall Market and foodie paradise Borough Market. Snap-worthy sights include Shakespeare’s Globe Theatre, St Paul’s Cathedral, the Tower of London, Monument, the London Eye and Big Ben. Involving some time on roads, the route suits confident cyclists, including children. Meeting point, outside Southwark Underground Station, London SE1. Just 10 minutes from Hammersmith, award-winning nature reserve London Wetland Centre is an urban oasis. Bringing 105 acres of countryside to the city, it’s run by the Wildfowl & Wetlands Trust (WWT). The lakes, ponds, and gardens are gorgeous in spring, with ramble-friendly paths leading you to six hides for watching wildlife. You’ll spy returning birds, sand martins nesting, ducklings hatching, butterflies appearing and daffodils blooming. There’s a café and play areas, with daily activities including meeting the otters and bird feeding with a warden. 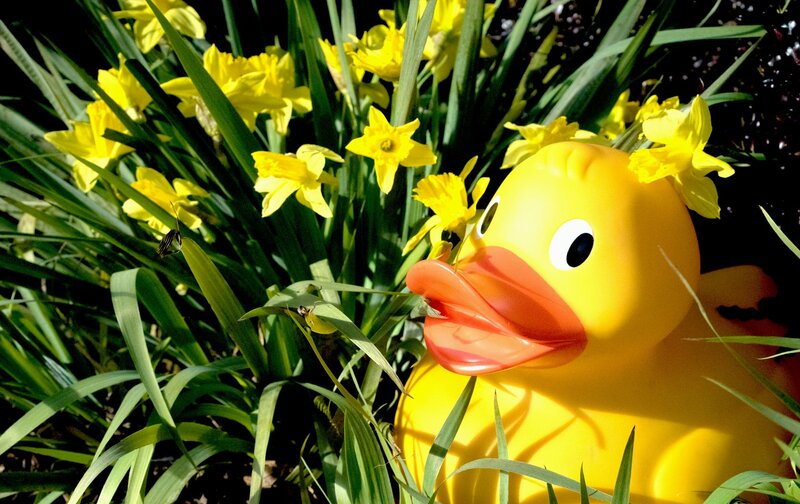 Easter ramps up the fun, care of Dusty’s Giant Duck Hunt (30 March-15 April). Kids can search high and low for giant ducks along the nature trails, with a prize for finding them all. WWT London Wetland Centre, Queen Elizabeth’s Walk, Barnes, London SW13. Get into the true spirit of spring and Easter in London by watching a free performance of ‘The Passion of Jesus’ in central London. 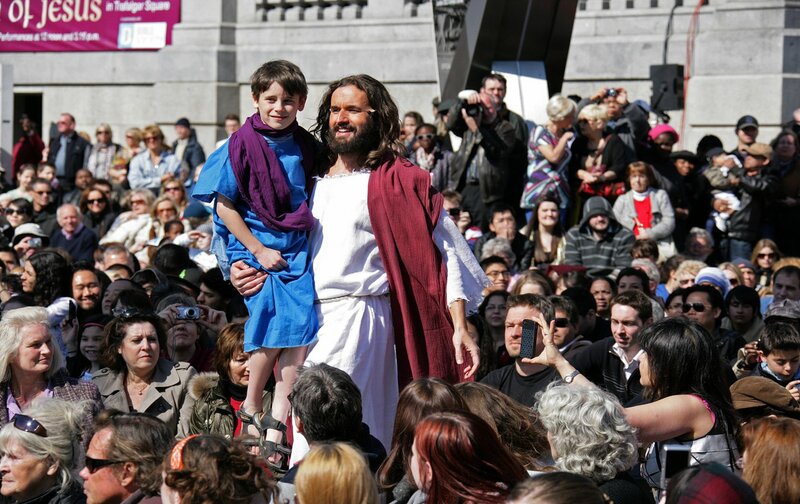 On Good Friday, around 20,000 people will gather to see the Easter story in Trafalgar Square. Performed by a hundred Wintershall players, the open-air production harnesses large screens to share the tale of Christ’s final days. Lasting 90 minutes each, there will be two shows, at noon and 3.15pm. Backed by the Mayor of London, it should be a moving experience, although realistic crucifixion scenes may require parental guidance. Trafalgar Square, London WC2. 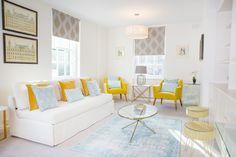 Light and airy, with spring-fresh yellow decor details, London Perfect apartment Gordon sleeps up to four in chic Kensington. This comfy, contemporary getaway is a short stroll from Kensington Gardens if you fancy soaking up the season’s natural charms. Travelling in a bigger group? Danebury sleeps up to six in boho Notting Hill, with a generous private roof terrace for drinking and dining alfresco. Vibrant Portobello Market is nearby for alfresco antique shopping, lined with bars, pubs, and restaurants. They’re perfect apartments for spring and Easter in London! 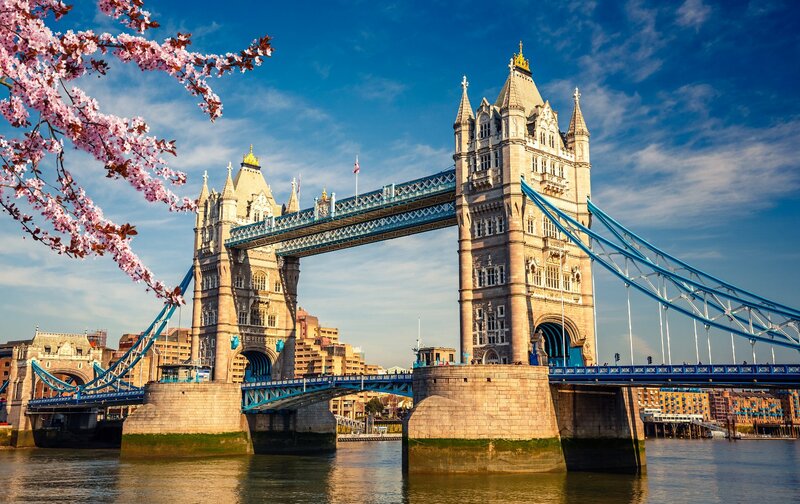 For more London Perfect spring experiences, check out our tours and services, including walking tours, Thames River cruises, and excursions. Read about lovely things to do in February in our Valentine’s Day in London blog. Posted on Tuesday, January 30th, 2018 at 10:07 am in What's On. You can follow any responses to this entry through the RSS 2.0 feed. You can leave a response, or trackback from your own site.